Part of the appeal is that weaving a product by hand always has a special, made-with-love quality that machines can’t replicate. Weaving also reflects the unique, cultural heritage of where the product originated. Senegalese crafts people have different methods than those in Ho Chi Minh City, something which gives an object a rich, irreplaceable character. It’s this deep-seated sense of tradition that is inspiring designers to come up with innovative uses for the ancient technique. 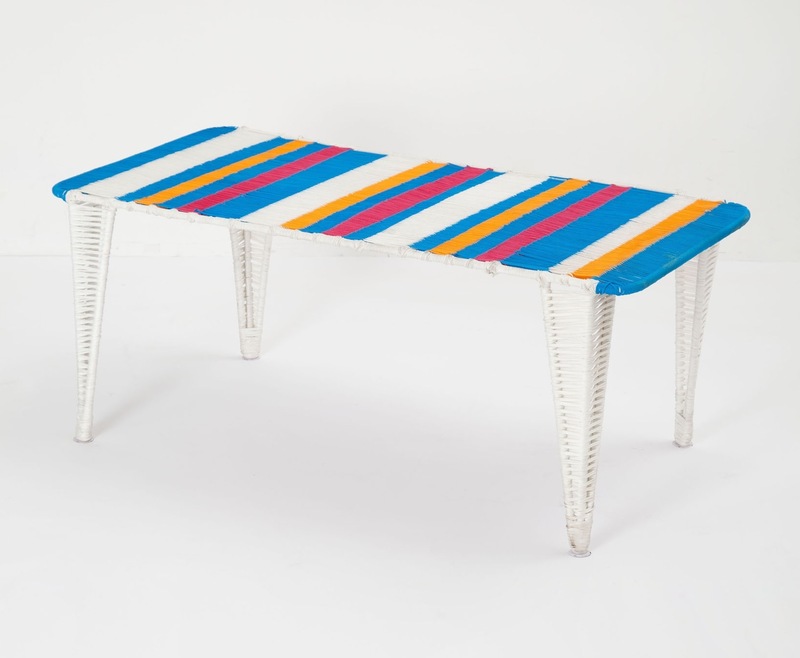 Talented young furniture makers are plaiting with unconventional materials like plastic pop bottles, or creating cross cultural mash-ups for unique tables, light fixtures and stools. Here, five masterfully woven pieces for the home. Pop art: Disturbed by the massive build-up of plastic waste in the Pacific and Atlantic oceans, designer Alvaro Catalán de Ocón wanted to create a product that would help to prevent single-use pop bottles from going out to sea. 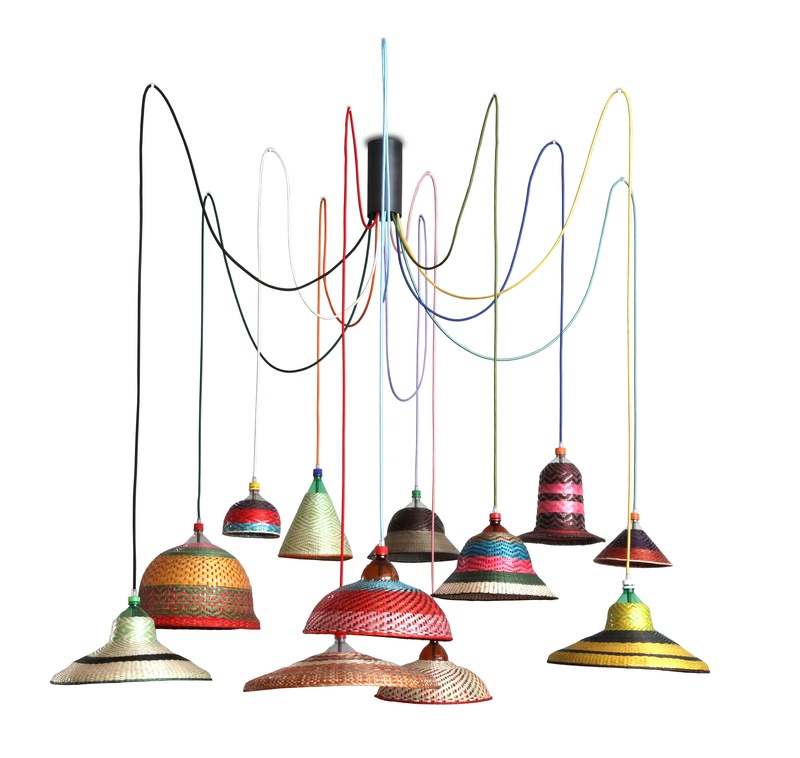 The Spaniard worked with artisans in Colombia – a country with a troubling amount of debris drifting from the oceans into its Amazon region – to create the PET lamp. The warp is made from strips of old plastic bottles. The weft is made with dyed papa tetera palm fronds, wool or cotton. Through catalandeocon.com. 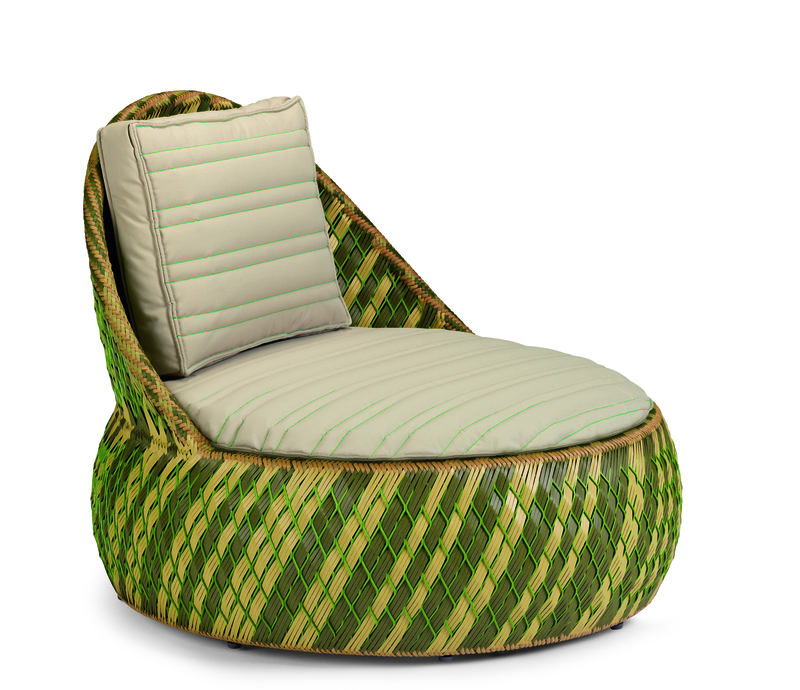 From trash to chair: Stephen Burks’s Dala lounger was inspired by handmade furniture the American saw while visiting artisans in Senegal and the Philippines (dala means “to make” in Senegalese and “to take” in Tagalog). The structure of the chair is a lightweight, aluminum mesh, onto which colourful strands of recycled polyethylene and Tetra Paks are woven. Through dedon.de. Two for one deal: On a trip to Spain, German designer Sebastian Herkner was intrigued by a technique of curling paper into long, yarn-like strands. With famed Italian manufacturer Moroso, he developed a method of wrapping the natural fibres around a sturdy metal frame. 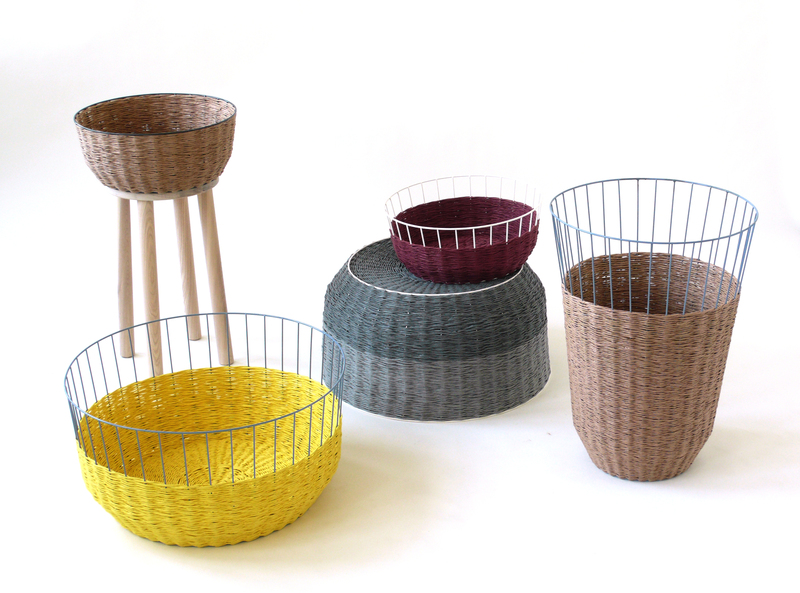 The resulting baskets can be used to store sweaters or magazines, but they can also be flipped over into colourful coffee or end tables. Through moroso.it. Blanket stripes: Anthropologie’s handwoven Lita table looks like an eccentrically coloured pioneer’s blanket that was left on the loom. But rather than soft wool, the strips are made from long-lasting polypropylene, and the frame is iron, so it won’t break down from spilled drinks or too much time in the sun. Through anthropologie.com. East meets north: The Superheroes collection is a cross-cultural mash-up of Swedish and Vietnamese influences. 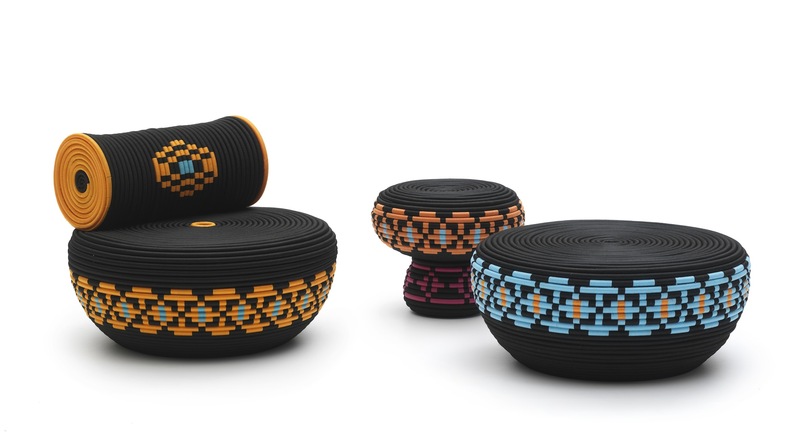 Designers Mattias Rask and Tor Palm (who run Glimpt Studio in Stockholm) were inspired by weavers in Ho Chi Minh City to create the bowl-like shape of its lounger, coffee table and stool. The pair worked with Swedish illustrator Malin Koort to create the Nordic-style patterning. Through cappellini.it. This piece originally appeared in the Globe and Mail on Thursday, May 16, 2013. This entry was posted in Design Spy and tagged Basket Weaving, Cappellini, Design, Furniture, Globe and Mail, Moroso, Philippines, Senegal, Vietnam by mmhague. Bookmark the permalink.